Chances are good that if you read yesterday's post about that racing simulator, you're a fan of racing games. And, chances are also good that the racing games you play and love so damn much are first-person — basically, where you're looking out of — or over — the windshield. Let's meet the unsung German engineer who, way back in 1976, first developed the technology that's spawned everything from Forza Motorsport to Gran Turismo — Dr-Ing. Reiner Foerst. Racing games have been around even before video games, but the type of racing game the good Doctor-Engineer came up with is the one that really defines the genre now. And he created it in an era when "video game" meant two lines whacking a square ball back and forth on a screen. Early video racing games were invariably overhead-view perspective, like you were an angry god looking directly down at those silly humans running around in their cars. They were fun, but didn't really feel like driving. To do that, you'd need a first-person view, something that simulated the view out the windshield of the car (or from just above it). With 1970s computer technology, that seemed like a pipe dream. "My invention of a driving simulator was not initiated by any interest in games, but rather an interest in Simulation theory and engineering." However, to raise money, he planned on making an arcade version of his simulator first. He checked out BP's and Volkswagen's elaborate early driving simulators, which were projection-based for BP, and an amazing oscilloscope-based one for Volkswagen. Both were wildly complex and expensive. Foerst realized there was no way these technologies would scale down enough to make a viable game. After some abortive attempts with light-bulb based displays, Foerst found his solution when he encountered a Pong machine in 1973. He acquired one, ripped it apart, and started designing his own TV-screen based driving simulator based on the nacent video game technology he found in Pong. The result, like Pong, used no CPU (that is, no central "brain" like a modern computer uses), employing many discreet dedicated circuits for the game. And I mean many. The game, called Nurburgring 1, had an electronic brain with 28 separate cards mounted in a huge rack. For comparison, Pong used, let's count, one. The visuals were simple, but effective. The twisting roadway was defined by a series of rectangular white "posts" on either side. The background was just black, but the lower portion of the screen had a speedometer, mileage and other indicators. There was also an image of the hood of your car, but that was a vinyl applique and not electronically generated. "...was given a piece of paper with a picture of a game cabinet that had a small portion of the screen visible. I don't recall if it was an actual flyer for the game or simply a Xerox of the front page of the flyer. I recall it being German or maybe I was just told it was a German game. I never saw the game play nor did I know what scoring was used on that game, only that there were a few little white squares showing. With that germ of an idea, out popped Night Driver." "Germ of an idea" pretty much translates to "stealing the game", but, let's face it, pretty much every video game company was stealing from each other at that time. 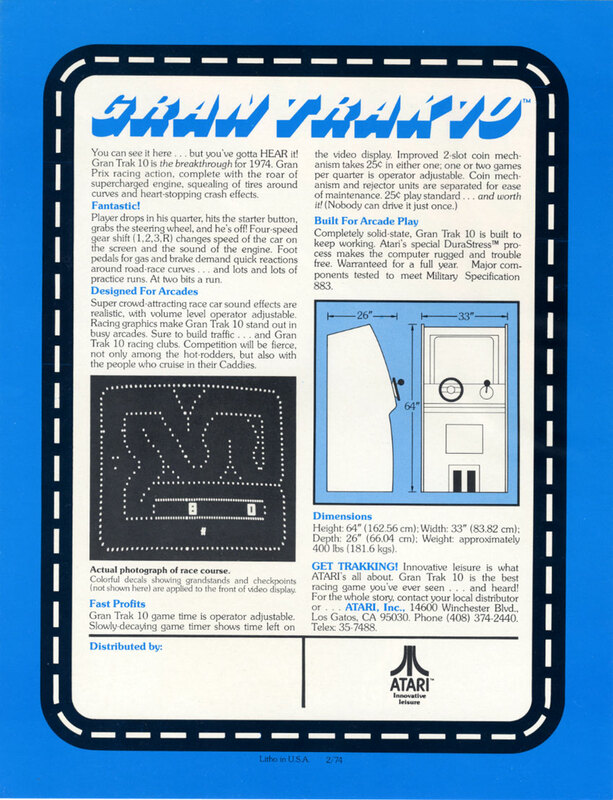 Atari was much better about making the game cheap to produce (using one board instead of almost 30 boards) so they, along with some other copycats, dominated the segment instead of our intrepid engineer. Dr.Foerst, denied massive arcade successes because of the rampant copycats, remained undaunted, producing several other versions of the Nürburgring game series. Number two was motorcycle inspired (handlebars replaced steering wheel), three was full color with selectable backgrounds (mountains or rolling hills), but the real exciting ones stemmed from Foerst's interest in simulation. Nürburgring 3/Power-Slide and Nürbergring 3/Turn-Table were actually moving cabinets, with Power-Slide banking the driver's seat angle and Turn-Table rotating the entire cabinet to match the direction of steering. That beats the hell out of Out Run's vibrating steering wheel. 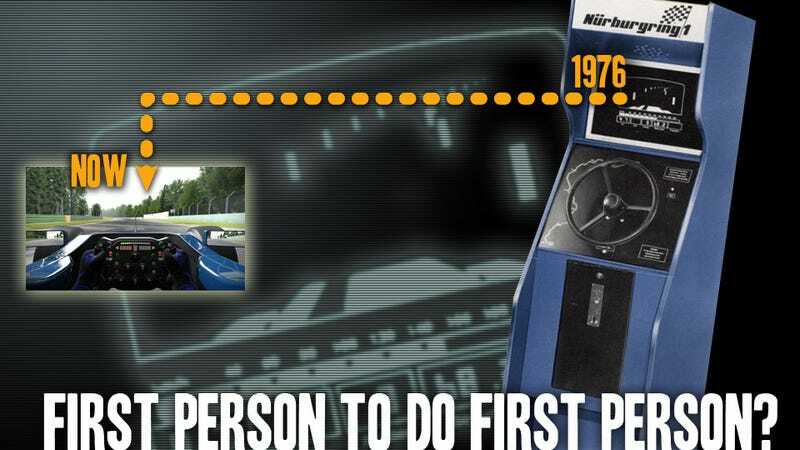 Today, Foerst's company makes some amazing simulators, but he's still largely unknown as the father of first-person driving games. That's what happens when your idea gets stolen and mass produced for cheap by everybody. So, let's change that, and raise a controller to this serious man who brought us all some serious fun.